Hobby Claim Service is an independent adjusting firm owned by Doug Hobby and his wife Tracy. Doug is a 1986 graduate of La Harpe High School and graduated in 1990 from Eureka College with a Bachelor's Degree in Business Administration. Doug's friend, Troy Morris, was working at Economy Fire and Casualty and he was able to get Doug a job as an adjuster in 1991. Doug liked the work and continued as a multi - line adjuster until 1995. Then, Doug made the move to a regional claims office for an independent company out of Macomb until 1998 when he decided to open his own business out of his La Harpe home. Most of his work comes from smaller mutual companies, but he also does work for the larger companies when their normal adjusters are unavailable. He is a multi-line adjuster offering services in the lines of automobile appraisals, property appraisals, bodily injury and general liability, fire losses, farm losses, storm claims, and much more. "We pride ourselves in providing competent adjustment of all types of insurance claims in a time worthy and cost-effective manner. More importantly, our devotion to personalized claims service puts us a step above the rest," he said. They are a member of the Adjusters Association of Central Illinois and services midwestern and mideastern Illinois, southeastern Iowa, and northeastern Missouri. In 2004, Doug opened a branch office in Bloomington and was able to repay the favor and asked Troy (Morris) to run the office for him. Doug had the opportunity to go to Mississippi for 30 days and help after Hurricane Katrina hit the Gulf. It was the worst devastation he had ever seen. So many families had nothing left and others didn't have the coverage they needed," he said. The best part of his job is being able to meet people and help them with their claim problems, and he enjoys working with Tracy on a daily basis and being able to work around his families schedule. Tracy, his office secretary, says that it is a joy to work with Doug everyday. She stated that they complement each other. Doug says he is technologically challenged so Tracy takes care of that part of the business, and she really didn't like being on the roof for the picture. 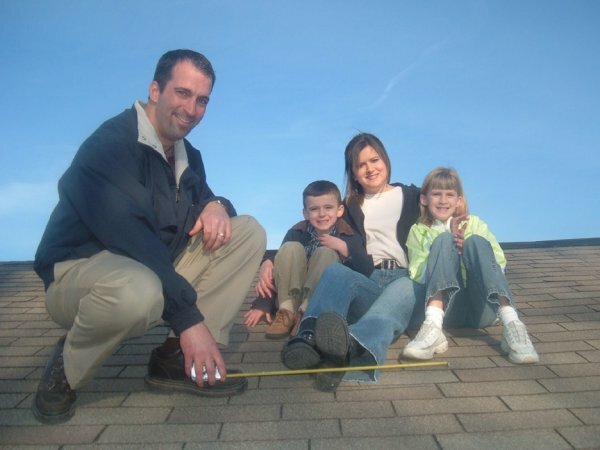 However, Kelsey (9) and Riley (5) loved it and got to climb up on the roof and see what Dad does. They thought it was great being up that high and waved at the neighbors who were outside. Kelsey is in tumbling and has played soccer. Riley likes to fish and play soccer and summer baseball. They enjoy the Ozarks as a family where they share a cabin with family members and they like to stay at a cabin at Doug's parents. The newest adventure is to go to Fun City in Burlington, IA. and they also like to go to the movies as a family. They said God has blessed them so many ways and they give thanks to Him every day.